Since IE6 comes as 6.1.4 or higher, Internet Explorer Mobile can work in IE6 or the older PIE mode. For some web sites you may downgrade to PIE (Pocket Internet Explorer) mode. You will get scroll bars and a standard menu bar and no on-screen zoom option. 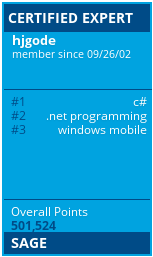 With Windows Mobile 6.5.3, sorry, Windows Embedded Handheld 6.5.3 we have the Internet Explorer Mobile 6 engine. Although it may look nice for the one or other, the rendering, especially the zoom in and out is unusable for commercial use. The IT departments of Warehouses and Stores designed there mobile web pages for a fixed size layout of 240×320 (QVGA). Using IEM (Internet Explorer Mobile) these pages do not show well. Either they are to small to read or, if zoomed in, the user has to scroll here and there. Not very usable. Event the Fit-To-Screen option does not help. The predefined viewport or 1024×768 may be good for browsing non-mobile web sites but I was unable to find a suitable setting for mobile sites with a fixed QVGA or VGA layout. I assume you will find these better for commercial use than the desktop settings.